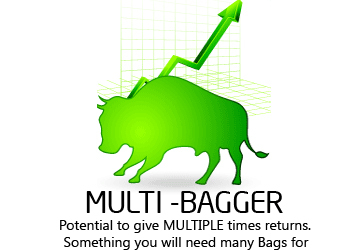 The multibagger stock is a stock that can give multifold return to the investor. A good multi-bagger stock can make you wealthy. However, it is difficult to identify good multibagger stocks for investment. Investors are always looking for a method to identify good multibagger stock for investment. In this post, I will share a method to identify good multibagger stock for investment. Along with that, I will also share 5 Multibagger Stocks that have generated multi fold returns for the investor. A multibagger stock is a financial jargon used for a stock that gives a return of more than 100%. A stock that gives several times returns on the cost is called multibagger stock. A stock that doubles its price is called two-bagger stock. First multibagger stock in the list is Caplin Point Laboratories. Caplin Point Laboratory is Pharma Sector Company. A stock of Caplin Point Laboratories was trading at Rs.15 before 5 years (2013) and today share price has crossed the level of Rs.620. This means stock of Caplin Point Laboratories has given 110% return to the investor in last 5 years. Investment of Rs.10000 in this stock has grown to 11 Lakh in last 5 years. Avanti Feeds is from Aqua culture sector. Avanti Feeds has turned out to be another multibagger stock for the investor. A stock has grown by 67 times since past five years. Investment of Rs.10000 in this stock has grown to 6.8 Lakh in last 5 years. Polson is chemical segment company dealing in dyes and pigments. In last 5 years, this stock has grown from level or Rs. 578 to Rs. 19561. Investment of Rs.10000 in this stock has increased to 3.38 Lakh in last 5 years. Arrow Greentech is the biggest manufacturer of water soluble films. The stock of Arrow Greentech has multibagger stock from penny stock. This stock was trading at Rs.8 before 5 years and today it is trading at Rs.452. « How to Stop Living Paycheck To Paycheck?